The first village on the expansive stretch of Hatteras Island, Rodanthe gained nation-wide recognition in 2008 with the release of the star studded movie “Nights in Rodanthe” based on the Nicholas Sparks novel. In fact, the house, “Serendipity”, used in the film is available to rent! Besides its mark on Hollywood, Rodanthe is rich in history and home to the Chicamacomic Lifesaving Station. Rodanthe is the location of the first U.S. Lifesaving Service, today’s U.S. Coast Guard, establishment on the North Carolina coast. Rodanthe prides itself for its historic Coast Guard roots and continues to showcase re-enactments using the breeches-buoy rescue cannon. 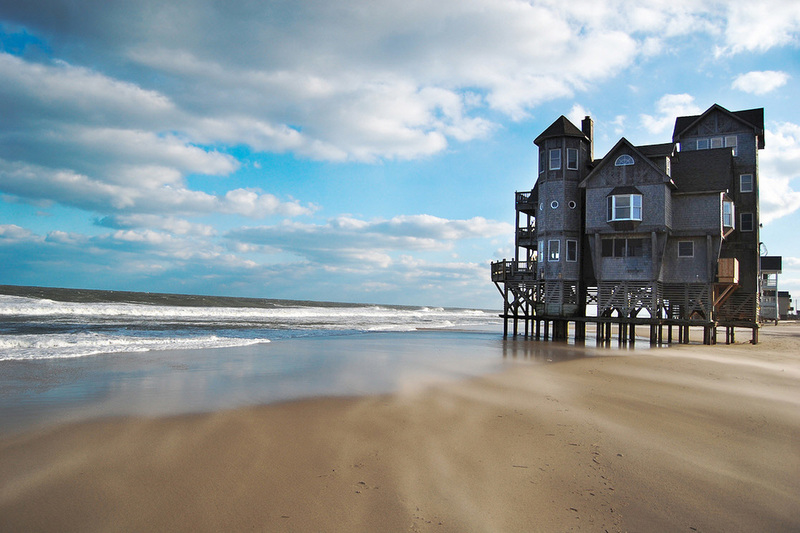 Rodanthe also offers a variety of accommodations with beach cottages, condos, an RV park and campgrounds. And Rodanthe’s northernmost neighborhood, Mirlo Beach, is frequented and loved by surfers but unfortunately also falls victim to the harsh storms during the fall months. And if you drive just a bit further north, you can visit the Pea Island National Wildlife Refuge which offers outstanding bird watching and sunsets!